Oh, you'll see when you slip this beauty on! There are also a few hidden treasures like a touch of trapunto, unique little pleated gathers and so on... I'll let you discover them for yourself. Hmmm, how many ways did I say this could be worn? 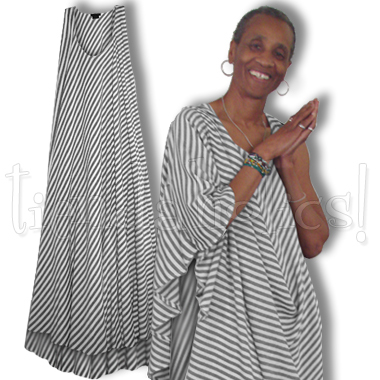 The possibilities seem as endless as the 200" hemline... or as your own creativity! And the handmade quality of this natural susti fiber is simply superior, rich, and luxurious. You can save it to wear for special events—it's perfectly elegant with the right accessories—but it's so scrumptious, you'll find ways to dress it down to wear more often! It's fantastic with tribal jewelry—wood, bone, chunky stones—and among the 50 gorgeous color choices, you're sure to find one that will easily blend into your already fabulous susti wardrobe. The unique design is equally perfect for evening or play, and will make you feel like you're in a Moroccan bazaar, Middle-Earth, or in some wild gypsy dream! Let your inner goddess frolic every day... why not?